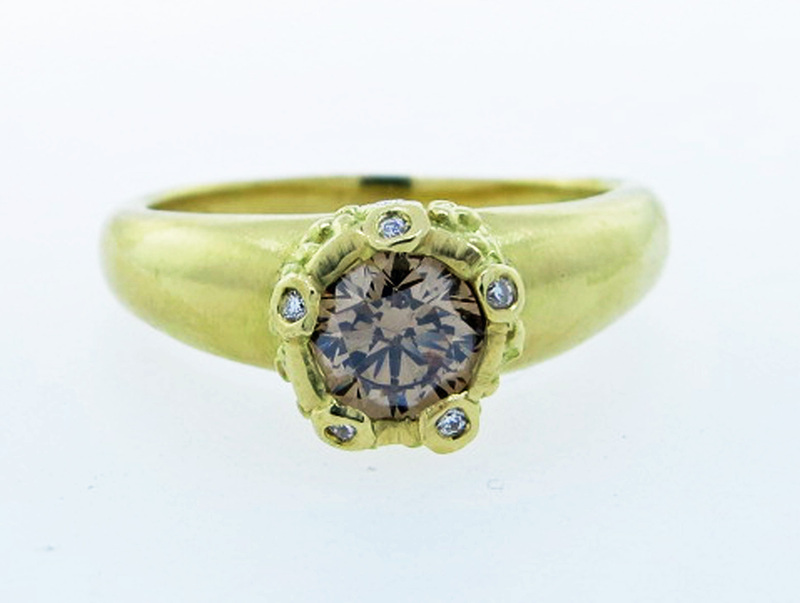 Handmade platinum mount diamond ring in a flower design. The center is bezel set with a round European cut diamond weighing approx .70cts. The surrounding mount is bead set with 24 old cut diamonds totaling approx 30cts. The ring is size 7 3/4 and can be sized. Platinum mount fancy color diamond ring made by J.E. Caldwell circa 1960. 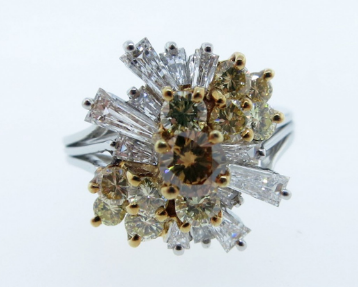 The center is prong set with a fancy natural cognac color round brilliant cut diamond weighing approx. .25cts. ten natural yellow color diamonds and twelve baguette cut white diamonds . Total diamond weight approx. 2.0cts. The ring is size 6 1/2 and can be sized. Beautifully engraved 18kt. white gold mount ring. The center is bead set with a round old mine cut diamond weighing approx. 1.1 cts. grading Vs clarity H color. The ring is circa 1930 and weighs 8.3 dwt. The ring is size 10 and can be sized. Platinum mount wedding band made by Michael Beaudry bead set in an open heart design with 1.25 cts. of round brilliant cut diamonds grading VS clarity G-H color. Size 6 1/2. Sapphire and diamond eternity band size 7 1/2. 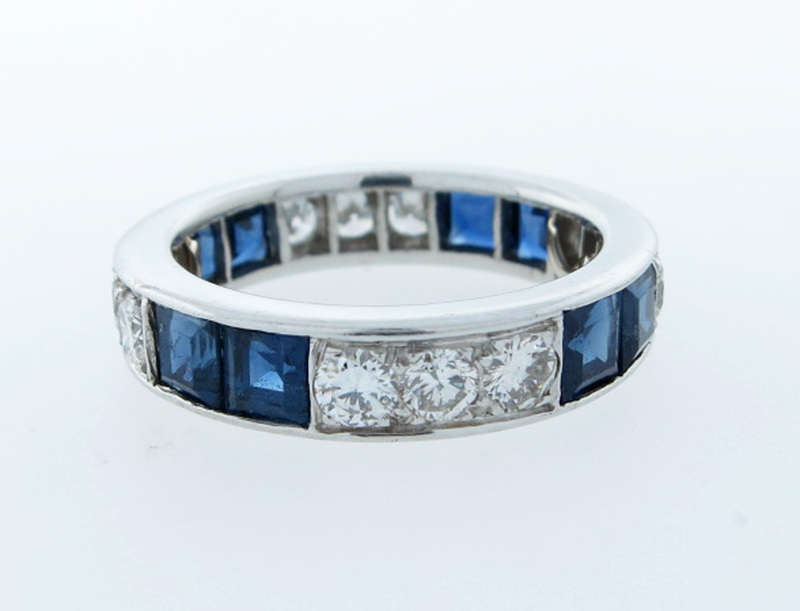 The platinum mount is channel set with four sections of natural blue sapphires totaling approx. 2.2 cts. and four sections of round brilliant cut diamonds totaling approx. 2.4cts. grading VS clarity I color. Ladies 18kt. white gold cluster ring. 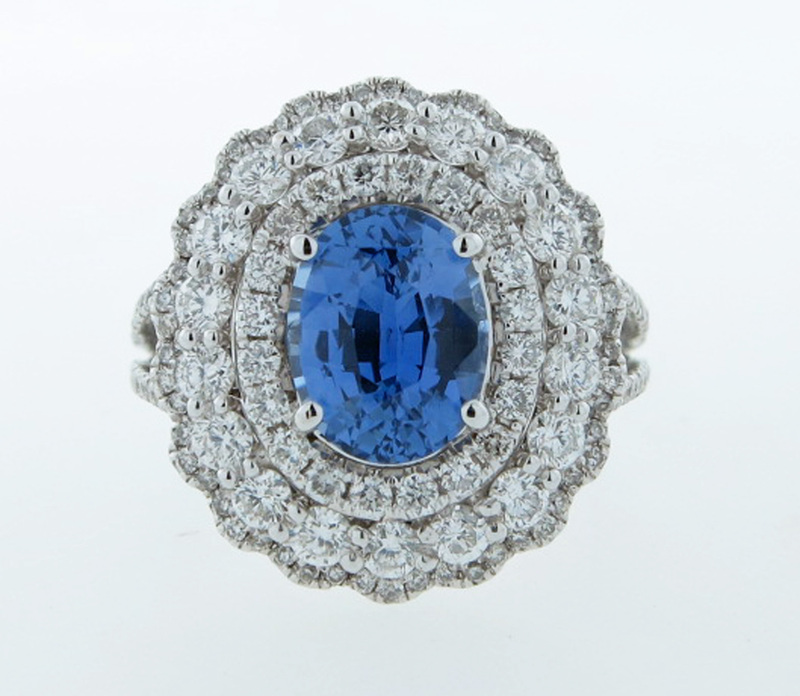 The center is prong set with an oval faceted natural cornflower blue sapphire weighing approx 2.4 cts. surrounded with three frames of round brilliant cut diamonds and diamond accents on each side of the shank. Total diamond weight approx 2.5 cts. 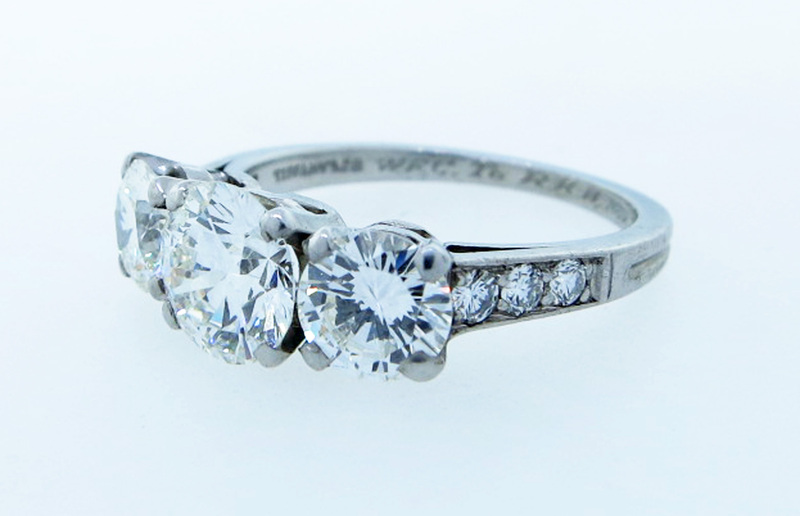 Exceptional quality and condition handmade platinum mount diamond ring. The center is prong set with a round European cut diamond weighing approx. .81cts. grading VS2 clarity H-I color. The intricate open work mount wraps beautifully and comfortably around the finger and is bead set with 66 old cut diamonds totaling approx. .75.cts. The ring is size 7 1/4 and can be sized. Circa 1920. 18kt. white gold set made by Simon G. The center is prong set with a square G.I.A. certificate diamond grading F color Vs2 clarity. The shank is set with .72cts of R.B.C. diamonds the matching band is set with .55cts. of R.B.C. diamonds. Size 6 and can be sized. Excellent as new condition. 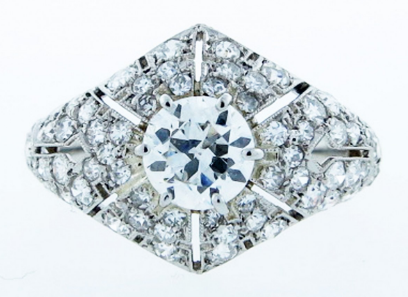 Platinum mount diamond ring prong set in the center with a round brilliant cut diamond weighing approx .70cts. and set on each side with a diamond each weighing approx .27cts. total diamond weight approx 1.25cts. Each side of the shank is bead set with three round brilliant cut diamond accents. The diamonds grade VS clarity H-I color. Size 5 1/2 and can be sized. Signed Tiffany & Co. Platinum mount bezel set ring appropriate for a man or a lady. 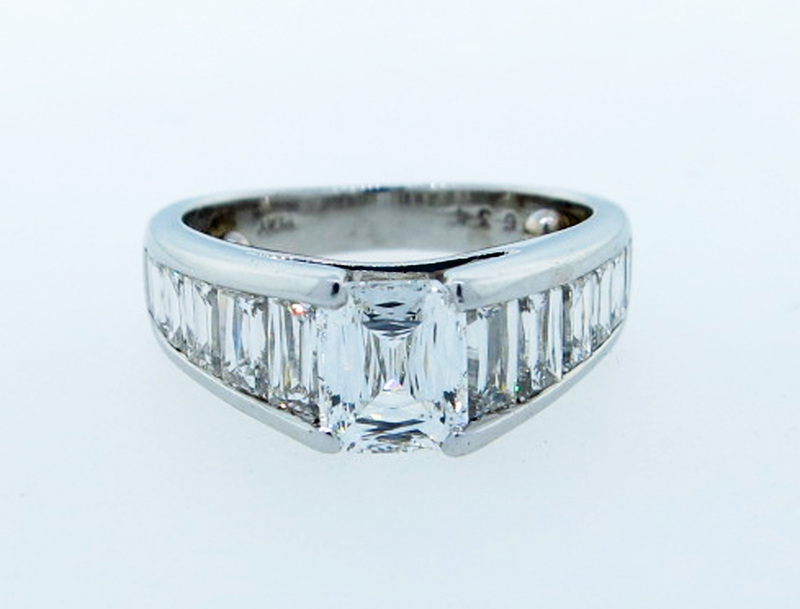 The center is set with an emerald cut diamond weighing approx. 1.85 cts. each side is set with a half moon shape diamond totaling approx 1.5 cts. grading G color VS clarity. Size 5 and can be sized. 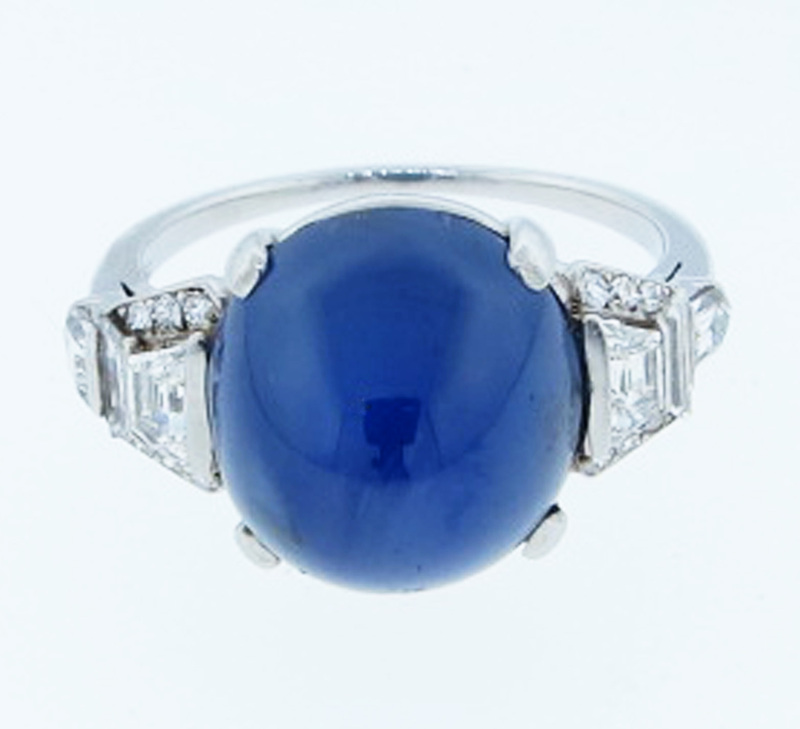 Beautiful platinum mount natural star sapphire and diamond ring made by Raymond Yard circa 1950. The center is prong set with a bullet shape Burma origin star sapphire weighing approx 13. cts. Each side of the shank is bead set with three tapered baguette cut diamonds and six round diamonds totaling approx .50cts. The ring is size 6 1/2 and can be sized. Signed Yard. Charming ruby and diamond ring in an 18kt. white gold mount. 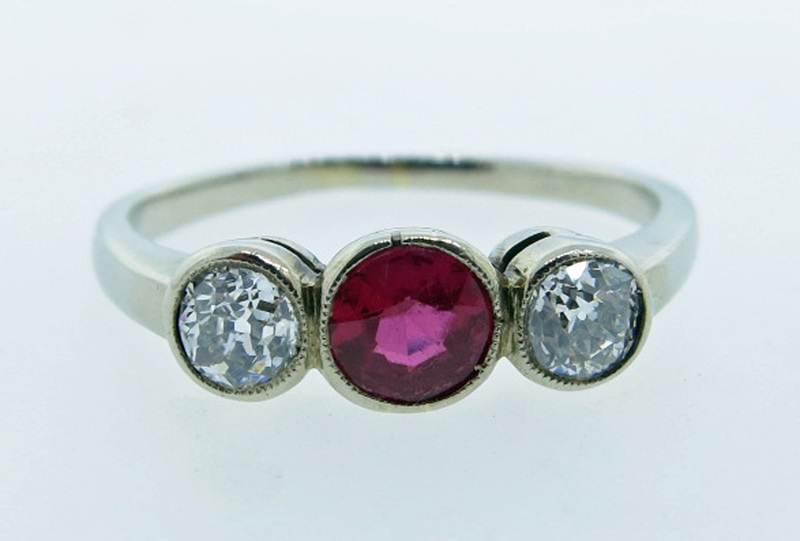 The center is bezel set with a natural faceted ruby weighing approx. .30 cts.. Each side is bezel set with a round old mine cut diamond totaling approx .30 cts. The ring is size 6 1/2 and can be sized circa 1900. Pretty handmade platinum mount diamond rind. The center is prong set with a round European cut diamond weighing approx .50cts. grading VS clarity H-I color SI1 clarity. Each side of the mount is enhanced with three tapering diamonds. 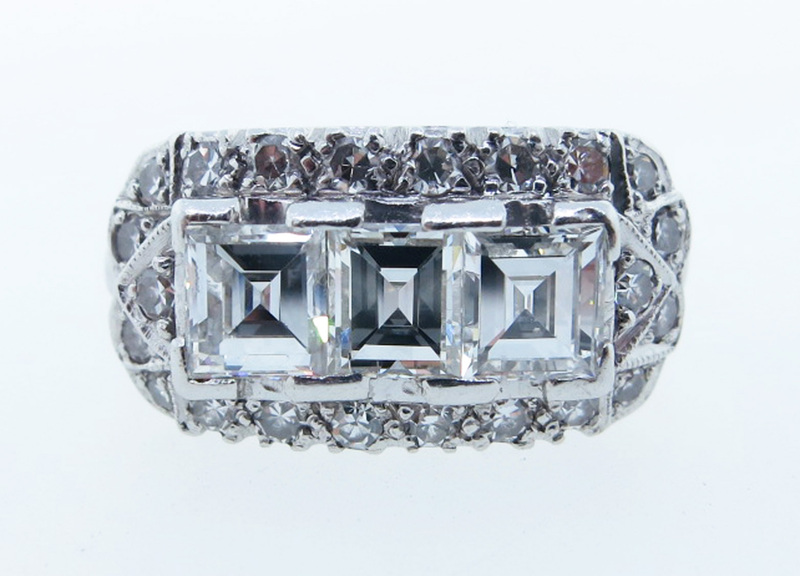 Platinum mount diamond ring set with three emerald cut diamonds totaling approx 1.5 cts. grading VS clarity G -H color framed with 22 round diamonds. Size 5 1/2 and can be sized circa 1930. 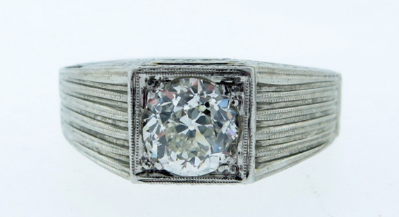 Platinum mount Art Deco diamond ring box set in the center with a round brilliant cut diamond weighing approx .70cts. grading VS clarity H color.. The hand made engraved mount is bead set with 18 round diamonds and four accent natural emeralds. Size 6 1/2 and can be sized circa 1925. Classic platinum mount sapphire and diamond ring. 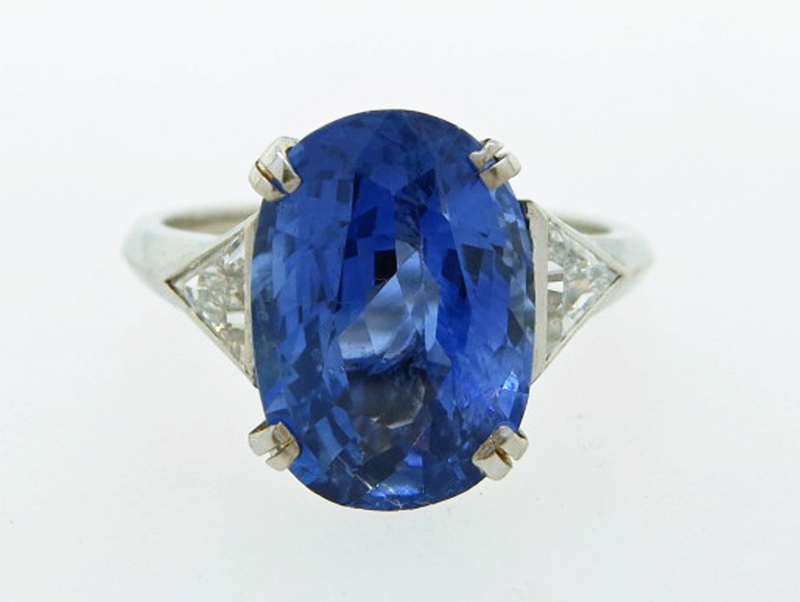 The center is prong set with a faceted natural cornflower blue sapphire weighing approx 4.2 cts. set on each side with a triangular cut diamond totaling approx .25 cts. The ring is size 6 and can be sized. Platinum mount ruby and diamond ring. The center is set with a round brilliant cut diamond weighing approx .50 cts. grading VS clarity G color surrounded by twelve diamonds and twelve faceted natural rubies in a pinwheel design. The ring is size 6 1/2 and can be sized. Contemporary design 18 kt. yellow gold handmade mount ring. The center is bezel set with a .60 ct. fancy intensely colored cognac round brilliant cut diamond weighing approx .60 cts. grading SI1 clarity. The mount is enhanced with ten round brilliant cut diamond accents. The ring is size 7 1/4 and can be sized. Platinum mount diamond ring. The center is tension set with a rectangular modified brilliant cut diamond weighing approx .87 cts. grading VS1 clarity G color. Each side is channel set with six graduating baguette diamonds totaling approx 1.0 cts. Size 6 1/2 with sizing beads and can be sized. Ladies 18 kt. 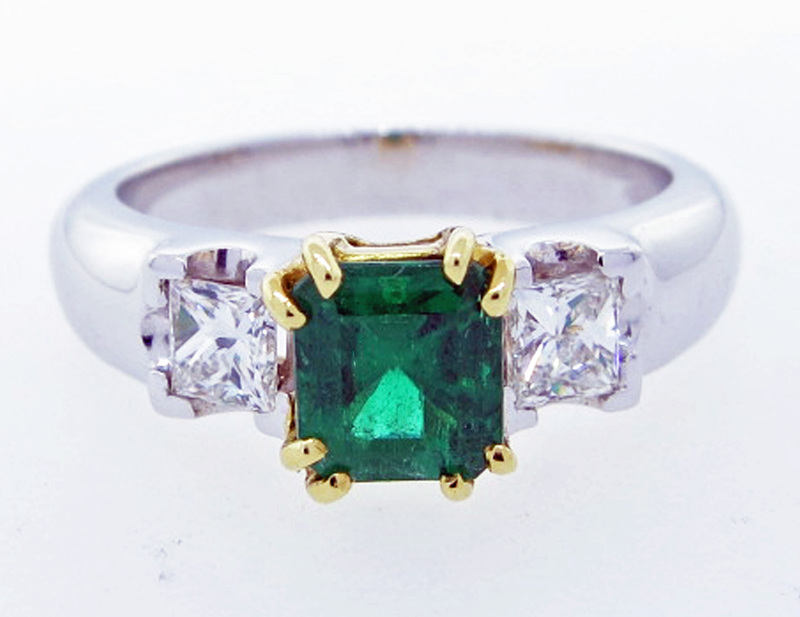 white and yellow gold three stone emerald and diamond ring. The center is prong set in yellow gold with a beautiful richly colored natural faceted emerald weighing approx. 1.0 cts. Each side is set with a square cut diamond totaling approx .50 cts. Size 7 and can be sized. 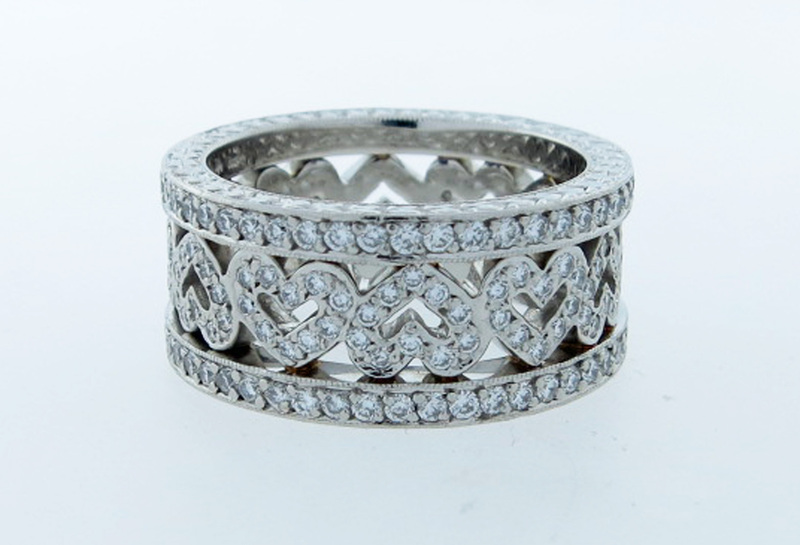 Platinum mount diamond ring, the center is fishtail set with a round brilliant cut diamond weighing approx .70 cts. grading VS clarity I color. Each of the shoulders are bead set with three round brilliant cut diamonds with mill-grained edge. Size 7 1/2 and can be sized. Ladies yellow and white diamond three stone ring. The center is set in 18 kt. yellow gold with a GIA cert. rectangular cut cornered brilliant cut natural fancy yellow diamond weighing .81 cts. The platinum shank is set on each side with a triangular cut diamond totaling approx .45 cts. The ring is size 6 and can be sized. Platinum mount GIA cert diamond and sapphire ring. 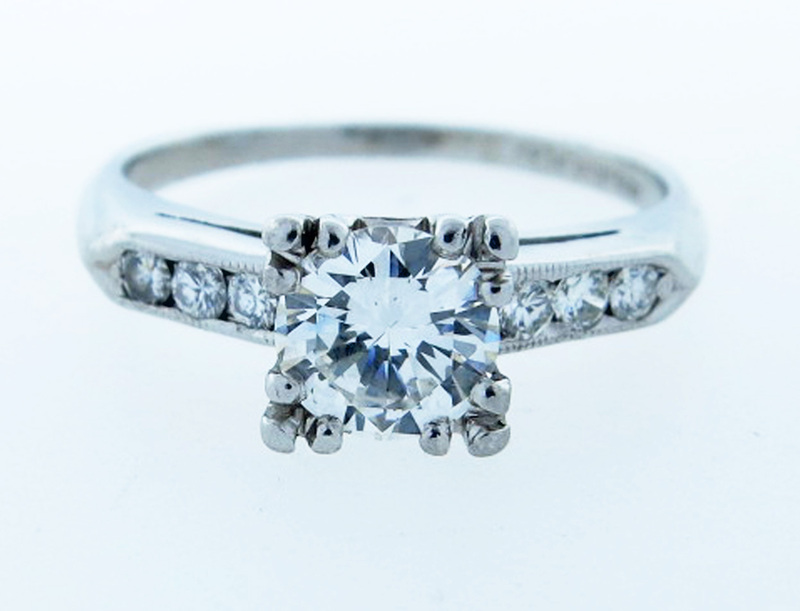 The center is prong set with a round brilliant cut diamond weighing 1.0 cts. grading I color VS clarity. Each side is set with a round faceted natural fine blue sapphire totaling approx .40 cts. The ring is size 6 1/2 and can be sized.